With Version 1.6.0 of Xfce4 Screenshooter, Xfce has gained considerable ground against Gnome and KDE when dealing with screenshot capabilities. The option to choose using the mouse pointer to hide or to display aspects over the graphic user interface is a new one. When the user deselects the option „Close the application“, the tool remains open after the capture of the screenshot. This is a considerable advantage over Gnome’s screenshot tool, which closes automatically after every screen frame capture. With Gnome, the user is forced to open the application every single time he or she wants to take a new screenshot. Also, the array of options open to the user after taking a screenshot are nicely designed: the images can be automatically saved in a predetermined folder, opened with specific programs, and can be uploaded to online resource ZimageZ. In the announcement of the new version however, the developers have designated the latter feature as experimental at this point. The user has to create an account with ZimageZ to take advantage of this capability. 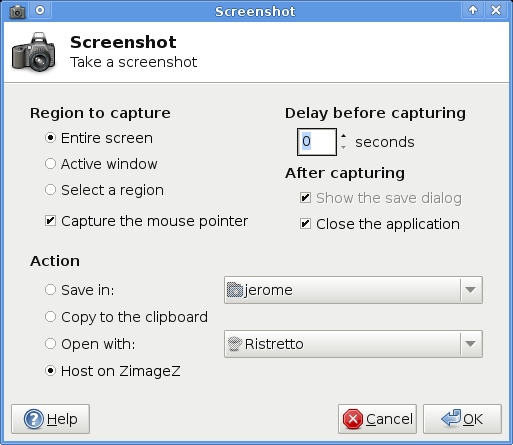 In addition, the Xfce4 screenshooter supports features which other desktops offer: the screenshooter can record either defined regions of active windows or from the entire monitor. The application also has an adjustable time invariant. Those who wish to download this tool may find the source code here. The feture to hide the pointer is not new. It has been already in the gnome's screenshot taker.